We all know that grocery stores can be incredibly busy, especially during the weekends. So, Molly Maid has put together these simple time-saving tips to help you get in and out of your grocery store with ease. Keep an ongoing shopping list. Making a list of items as you discover you need them can help ensure that you don't end up short on the essential items and then have to make extra trips. Lists can also help prevent you from overbuying. Bring a pen and cross off the items as you load them in your cart, or use the note application on your smartphone. Pick your route. Knowing the layout of your grocery store can make your shopping a whole lot quicker. Also, if shopping with your spouse or significant other, divide your shopping list between the two of you. If you have kids, leave them at home with supervision and do your shopping solo. Some Moms even recommend heading to the store after the kids are in bed. Shop during off-peak hours. 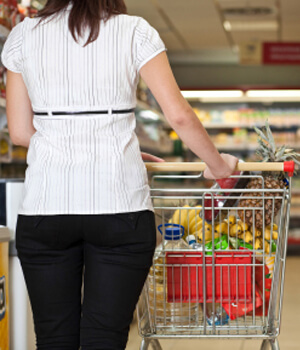 Shopping early to mid-week can be a great way to avoid crowds at the grocery store. Mornings are a great time to shop if you are able. Shopping late at night is another simple way to avoid lines. If not, waiting until after dinner to do your shopping can help you avoid post-work crowds. If you can't avoid shopping on the weekends, get to the store before noon. If you have to make multiple trips to the grocery store, try going on your lunch-hour and keep a cooler in your vehicle to keep items cold when you head back into work.